I’m Chantal from Chantal’s Corner and I’m excited to be a guest for Danielle today as part of the Canadian Beauty Bloggers‘ monthly guest posts. Our theme this month is Rose Quartz & Serenity; the Pantone colours of the year. 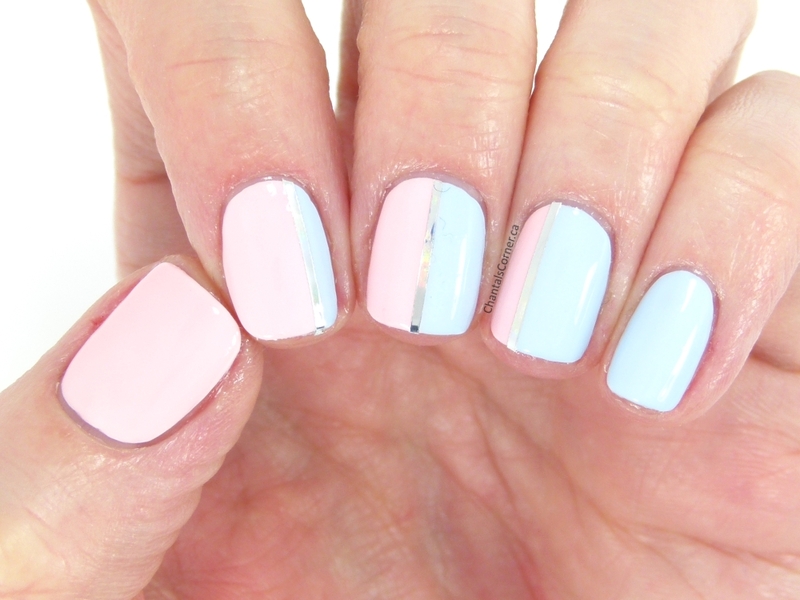 Let’s just call these what they are: a pale pink and a pale blue. 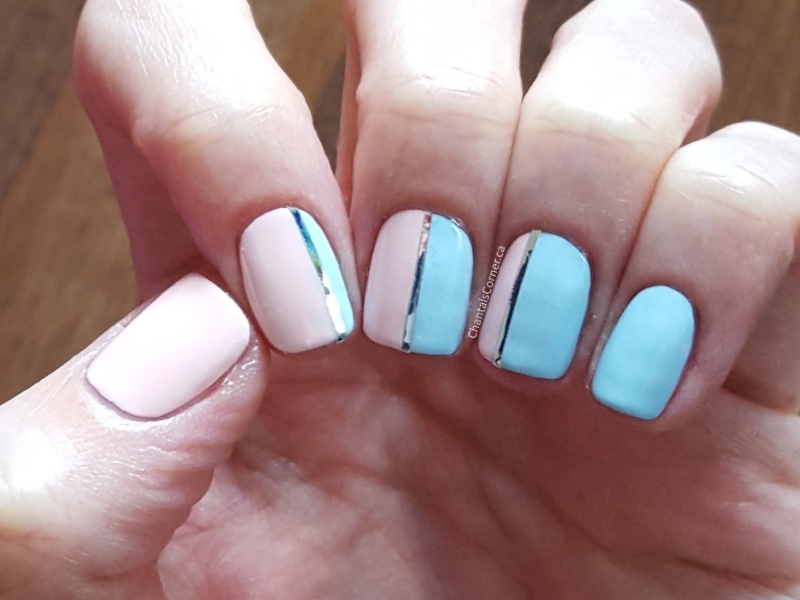 Trying to think of some nail art that didn’t feel too baby-ish was tough, especially when working with these two colours. These are actually the colours I used when I did some nail art to announce that I was pregnant two years ago. After LOTS of thinking this is what I came up with, and I’m super happy with them! At first I was just going to use Dot as my pink polish, but when I started applying it it was a bit sheer so I decided to give it a light pink base with Peony (I found Peony a bit too light by itself to represent Rose Quartz). So I applied two coats of Peony and added one coat of Dot on top. Celeste is a beautiful creamy blue that only required two coats for full opacity. 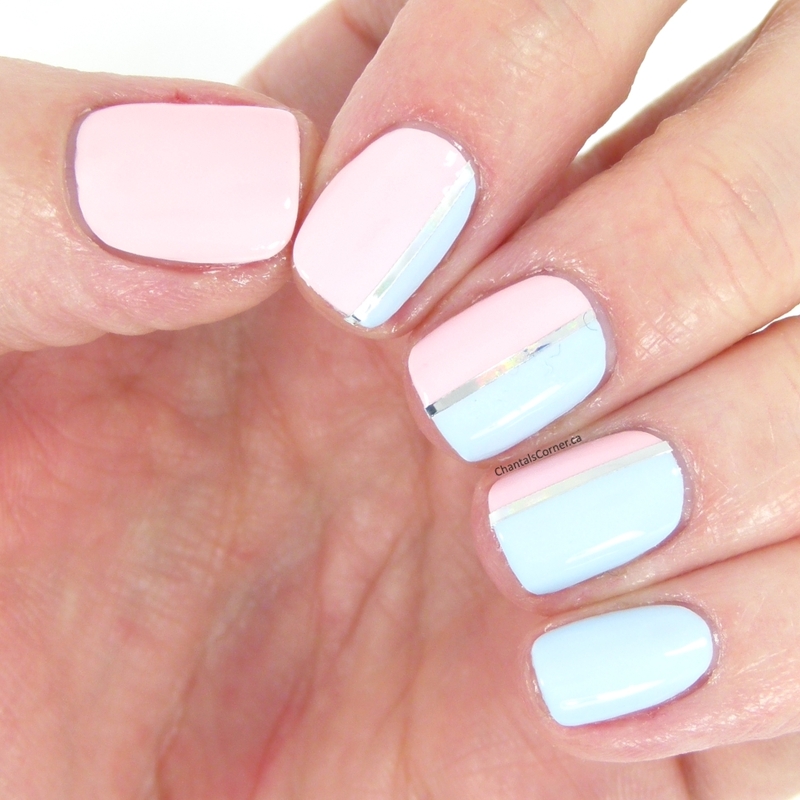 For the nails with both colours, I first put some masking tape to define where the pink would be. I then added one layer of Peony and removed the tape. I freehanded the rest (the rest of the pinks and the blue). Once all was done I added a line of silver striping tape to separate both colours, and then finished it off with topcoat. And voilà! I take my nail pictures in a light box and since it’s really bright in there it washes out the lighter colours. So I took a picture in natural light to give you a better idea of what it looks like… but even then the pink came out lighter than it really is. And that’s my post for you today. I hope you enjoyed it and thank you Danielle for having me as your guest! Thanks Chantal! I love how we both immediately look to our nail polish collections with the new Pantone colours come out. Pastels foreverrrs. Be sure to visit Chantal at ChantalsCorner.ca!